Tunas have firm, thick fillets and make succulent meat substitutes. Cutlets and steaks can be cooked by grilling, barbecuing, baking, smoking, poaching or marinating. Japanese demand for sushi and sashimi has highlighted some species superb eating qualities raw. Grilled or barbecued, tunas are best seared and left rare centrally. Highlight with intense flavours such as charred capsicum, eggplant, balsamic vinegar and olive oil dressings on a bed of bitter greens and aioli, roasted garlic, and Japanese wasabi, soy and pickled ginger. Alternatively, prepare a baked dinner of tuna, with a herbed crust to seal in the flavour and prevent it drying out. To marinate, use lemon, garlic oil, vinegar and fresh herbs. Serve as is (the marinade will cook the tuna), or slowly braise or poach as a finishing touch, but be careful not to overcook. Sashimi, carpaccio, or tartare blended with Atlantic salmon is ideal for tuna, married with dill, garlic, lemon and pepper. Tuna is also an excellent dish sliced thinly and briefly dropped into simmering fish stock or cooked as an Asian hot-pot to each diner s preference. Invite guests to choose the degree to which they want their tuna cooked just as they would with a steak. Serve well done tuna with a sauce. Tuna flavours are definite, and well accompanied by medium to full-flavoured white styles and some reds. Data presented are for yellowfin tuna. Caught year round, but supply varies depending on species and area. 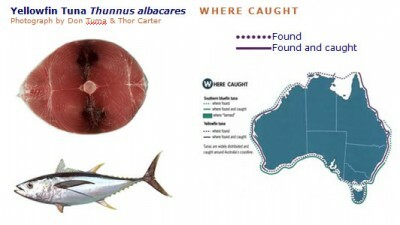 For example, southern bluefin tuna are caught off South Australia from December to March, off Tasmania from April to June, and off New South Wales from May to September. Tuna for sashimi must be stunned, bled, and processed immediately on capture. Flesh characteristics differ markedly between species. Albacore is referred to as the chicken of the sea due to its white flesh when cooked. Imports Pacific nations such as the Solomon Islands: tuna for canning Sashimi-quality tuna is imported from various South Pacific islands, including New Zealand. Grading Grading can vary by supplier, region and species. An example of a grading system for whole tuna is presented below.